People from all parts of Europe made their way to Calumet at the end of the nineteenth and the start of the twentieth centuries. The copper-mining town attracted so many immigrants — Germans, Italians, Croatians, Slovenians, Cornish, Irish, Swedes, Norwegians — that it’s sometimes jokingly referred to as “the smelting pot.” Finns would eventually outnumber them all. Many who came here from Finland to work in the mines and start a new life also brought with them, or quickly became versed in, dangerous ideas. In 1913, Finns were known as agitators, radicals, socialists. They organized in Keweenaw mining communities and in Hancock they published a newspaper called Tyomies, or The Workingman. Even their preachers espoused the social gospel, railing from the pulpit against the unfair treatment and indignities the miners endured, and advocating a more just ordering of society. Most of the men, women and children killed at Italian Hall on Christmas Eve, 1913 were Finnish-Americans. They were not all agitators and strikers or strikers’ wives and children; in fact, we interviewed people whose families were firmly against the strike and wanted the Western Federation of Miners run out of town, but nevertheless lost children in the mayhem at the Hall. The tragedy cut across the divisions of the strike even as it deepened some of them and created new ones. 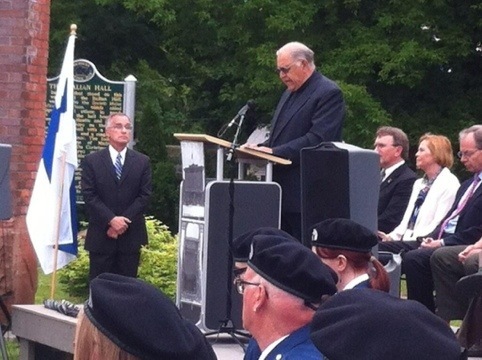 A wreath-laying ceremony in Calumet yesterday to honor the Italian Hall dead included a delegation from Finland. The ceremony was part of this year’s FinnFest, an annual celebration of Finnish-American heritage and culture. (1913 Massacre is screening twice at FinnFest.) 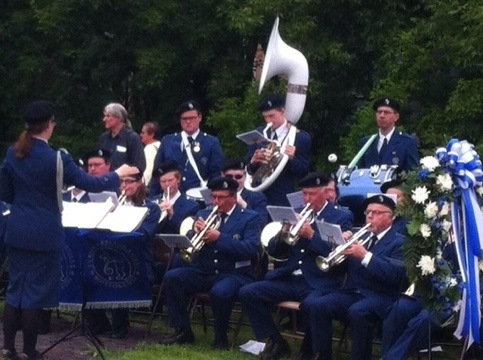 The Turun Metsankavijat Wind Band played the Finnish and American national anthems along with other, solemn music. Before the wreaths were laid by David Geisler, Calumet Village President, and Pertti Torstila, Finland’s Secretary of State in the Ministry for Foreign Affairs, Reverend Robert Langseth delivered an invocation. MOSES called the first strike! Against the Pharoah. — and he spoke eloquently and passionately about justice and the need for reconciliation. It was beautiful. People in the crowd were visibly moved and weeping. The ceremony had invited us to mourn and honor the dead. Reverend Langseth was asking us to do even more: to respect and honor each other. This entry was posted in Human Rights, Leadership, Louis V. Galdieri's Blog and tagged 1913 Massacre film, Calumet, commemoration, documentary, FinnFest, Finnish-Americans, history, Italian Hall, Italian Hall disaster, justice, memory, radical history, respect, Reverend Robert Langseth, social gospel, Woody Guthrie on June 21, 2013 by lvgaldieri.